Bollywood amazes me often these days. We are not churning out dated scripts with the same formula anymore. Rather, the same subject is being treated differently. 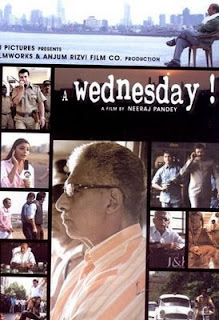 To be frank, when I heard that 'A Wednesday' was based losely on the Mumbai blasts, I sighed to myself. The subject has been done to death and yet another film playing on the emotional angle of the blasts did not excite me. Nevertheless, being a good sport, I agreed to go watch it. The film not only surprised me, it made me sit up and say 'Wow'! The script itself is unique and I wouldnt want to spoil it for you by telling the story. So I wont. Let us instead discuss the cast. The movie is built on 2 pillars, one being the extremely talented Anupam Kher and the second equally if not more - Naseeruddin Shah. Anupam Kher is so brilliant in his role that you find yourself hanging on to every word of his. He's smart, sharp and composed....characteristics that make him believable in his role of Commissioner of Police - Mumbai. Naseeruddin has time and again proven himself and he does it yet again...in a role where he has to play various characters at once, he does a job par excellence. The rest of the cast does a good job as well. Jimmy Shergill plays the angry young man in an interesting fashion. He's put on some weight and thankfully cut his hair...all in all, surprisingly he looks good as well. The movie is fast and the plot races on. When you feel you've got it all figured out, it takes a complete U Turn and leaves you speechless. The script also questions right and wrong and confuses you on what emotion you should feel at the end. If you like cinema that makes a statement, go watch this film. It will make you sit up. If on the other hand, you watch movies only for entertainment and songs, give this one a skip, my friend. after hearing all the raving and drolling over Rock On, i finally managed to catch it yesterday! and now i am racing to catch this before it goes off the theatre! !